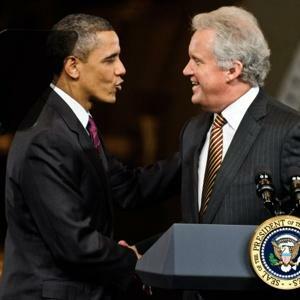 Back when he agreed to advise the Obama administration on economics, General Electric CEO Jeff Immelt told friends that he thought it would be good for GE and good for the country. A life-long Republican, Immelt said he believed he could at the very least moderate the president’s distinctly anti-business instincts. That was three years ago; these days Immelt is telling friends something quite different. Sure, GE has managed to feast on federal subsidies, particularly the “green-energy” giveaways that are Obamanomics’ hallmark. But Immelt doesn’t think he’s had anywhere near as much luck moderating the president’s fat-cat-bashing, left-leaning economic agenda of taxing businesses and entrepreneurs to pay for government bloat. Friends describe Immelt as privately dismayed that, even after three years on the job, President Obama hasn’t moved to the center, but instead further left. The GE CEO, I’m told, is appalled by everything from the president’s class-warfare rhetoric to his continued belief that big government is the key to economic salvation. The coalition of major corporations hoping to get rich off cap-and-trade legislation started to crack up yesterday when BP America, Conoco Phillips, and Caterpillar dropped out of the U. S. Climate Action Partnership (or US CAP ). Their defections end the exceedingly small remaining chance that cap-and-trade could be enacted this year. BP America and Conoco Phillips did not pull out because they realized that the Climategate scientific fraud scandal has revealed that global warming alarmism is based on junk science. Nor did they pull out because they finally recognized that energy-rationing policies will wreck the U. S. economy. They pulled out when it became clear that they were not going to get rich off the backs of American consumers if the cap-and-trade bill enacted is anything like the specific bills being considered in Congress. The Waxman-Markey bill that the House passed last June by a 219 to 212 vote and the Kerry-Boxer bill introduced in the Senate would, as intended by US CAP, raise energy prices for consumers through the roof. Unfortunately for BP America and Conoco Phillips, the primary beneficiaries of this multi-trillion dollar wealth transfer from consumers to big business would be electric utilities and General Electric. In other words, the two oil companies lost the political pushing and shoving match to James Rogers of Duke Energy and Jeffrey Immelt of GE. That’s no surprise: Immelt has been driving GE into the ground ever since he took over, but he’s a savvy political operator; and Rogers learned how to get to the government trough first from the master, Ken Lay of Enron. It is worth recalling that Enron Corporation was the leading promoter of the Kyoto Protocol and cap-and-trade before it went spectacularly bankrupt. Caterpillar’s case is different. As the major manufacturer of heavy equipment used in coal mining, Caterpillar must have been asleep when they joined US CAP. The National Center for Public Policy Research’s Free Enterprise Project has been gently shaking Caterpillar’s top executives for several years, and perhaps they finally woke up. So cap-and-trade is dead. But other piecemeal energy-rationing policies are still very much alive. The Environmental Protection Agency is going ahead with regulating greenhouse gas emissions using the Clean Air Act. Senator Lindsey Graham (R-SC) is working with Senators John Kerry (D-Mass.) and Joseph Lieberman (D-Conn.) on a “compromise” package that can gain bi-partisan support. Senator Jeff Bingaman (D-NM) has passed a renewable electricity requirement and new building energy efficiency standards out of his committee. And big corporations are still circling the trough. By my count, US CAP still has twenty-three corporate members plus eight environmental pressure groups that front for big business. And of course, BP America, Conoco Phillips, Caterpillar, and many other companies that don’t belong to US CAP still hope to make money off the “right” sort of policies to raise energy prices. The good news is that public opinion has turned decisively against global warming alarmism and energy-rationing. People have figured out that they, not big business special interests, will end up paying the bills when energy prices, in President Obama’s elegant formulation, “necessarily skyrocket.” In the November elections, the American people have a lot more votes than James Rogers of Duke Energy or Jim Mulva of Conoco Phillips.